In a classic battle of Tacoma vs. Seattle, undefeated Lincoln took a short trip down the road to take on suddenly streaking Seattle Prep. Could the dynamic Panthers attack send the Abes packing with their first defeat of the season? Lincoln took advantage of the home cooking early with leading scorer Trevante Anderson netting a dozen in the first half. Prep countered with another strong showing by Collin Welp whose recent performances have been gradually peaking. Additionally, Jaxon Woodward provided a nice boost to help bring the game to a 25-25 heading into intermission. The intensity of the ballgame grew as the game wore on with physical play leading to critical calls on the floor and big momentum swings. 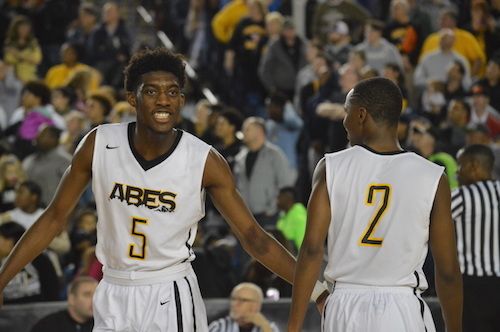 The Abes ability to contain Prep sharpshooter Aaron Nettles played a major role in the outcome as the senior was limited to 10 points in the contest. Collin Welp continued his strong play, but his comrade in the paint Nic Lynch struggle to find a rhythm. There were four Licoln players in double figures as Emmett Linton, Le’Zjon Bonds, and Willie Thomas joined their leader Anderson. The Abes did not waver in the closing minutes and walked away a dozen ahead of the Panthers. The win earns Lincoln a Friday night bout in front of their hometown crowd. 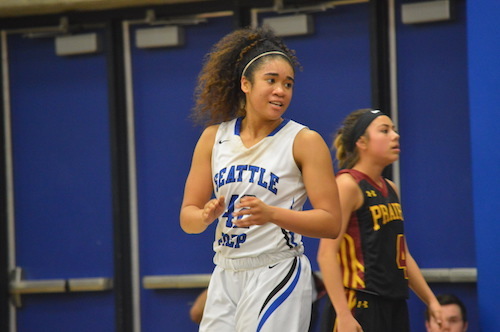 The lunchtime quarterfinal matchup in the girls 3A bracket featured Metro representative Seattle Prep fresh off a win against the defending champs Bellevue against 4A runner-up last season Snohomish. The winner would earn a trip to the semis and play the winner of Mercer Island against Kamiakin. Snohomish jumped out of the gates ready to compete taking advantage of Kyra Beckman’s strength in the low block. She led all scorers with 17 points in the ballgame. Seattle Prep was limited to a single field goal in the first quarter and were trailing by double digits early. As the half progressed, Prep was unable to find a rhythm and at the break found themselves trailing by 19. When play resumed, Snohomish kept the pedal down and were able to maintain a sizable lead. Katie Brandvold and Maya Duchesne added 11 apiece. Seattle Prep got a baker’s dozen from Marie Hauck who battled for a tough 31 minutes, but the lack of scoring options around her caused them to fall short. 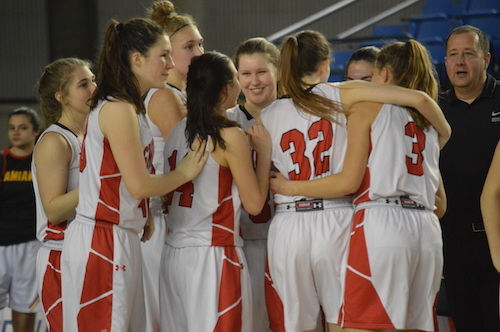 With the victory, Snohomish continues its quest to follow up last year’s second place finish with a title. Early March is the optimal time for a team to be peaking with its best play. For the Seattle Prep Panthers, they are doing just that. The opening round of the Hardwood Classic featured 11th seeded Prep battling against counterpart to the south in the Timberline Blazers. Which team would advance to the quarterfinals to face undefeated Lincoln? Mike Kelly’s Panther squad jumped out to a big lead early scoring a dozen before the Blazers found the scoreboard. It wasn’t until late in the first quarter when Timberline recorded its first points on an Erik Stevenson bucket in the paint. Collin Welp’s dominant effort in this ballgame was evident early as the senior post’s jump shot was falling in addition to controlling the paint. Despite leading by double digits at the break, a late surge by Timberline when the Prep attack stalled put the game within reach heading into the second half of play. When play resumed, the pace increased and the change favored Seattle Prep whose strong transition game led by Kalu Stricklin & Collin Gale contributed to a 25 point outburst in the third. Additionally, Welp buried some shots from the perimeter and Nic Lynch added a dozen in the low block to extend the lead. Timberline tried to keep pace with some tough shots by Tariq Romain and Hunter Campau but the fate of the game gradually became clear. The final frame was dominated by a gradual increase in reserves inserted to play by both sides to run down the clock with Prep’s victory looming. When the dust settled, the Panthers won in convincing fashion as they move on to face the Abes tomorrow. 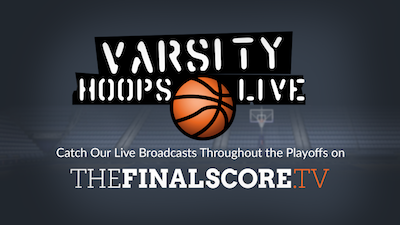 Catch our Live Broadcasts of the 3A State Tournament on theFinalScore.TV all week long. Regionals weekend at Bellevue College tipped off with a matchup between Metro & South Puget Sound as the Seattle Prep Panthers & Spanaway Lake Sentinels squared off to determine their placement at the Tacoma Dome next week. The big man tandem for the Panthers of Nic Lynch and Collin Welp played a pivotal role in the ball game as the pair nearly outscored Spanaway Lake in the first half; Sentinels 18, Prep bigs 15 after one quarter. Despite having a half dozen scorers in the first half for Spanaway Lake, there was not an explosive performance by any one in particular like Prep’s Lynch. An Alex Flor 3 at the halftime buzzer sent the Panthers into the locker room with a 27-18 lead. As play continued, the crafty guard Aaron Nettles made his presence felt by burying three from downtown to extend the lead. Isaiah Turner carried the Sentinels on his shoulders down the stretch scoring a game-high 21, but it wasn’t enough as another Nic Lynch surge in the fourth put the ballgame on ice. With the win, Seattle Prep will return to the Tacoma Dome next week. The nightcap of Regional play at Bellevue College on Friday night featured Seattle Prep & Prairie. The winner would earn itself a berth to state championship weekend at the Tacoma Dome in the first week of March. The first half was a back-and-forth affair with both teams firing from long range effectively. Brook Walling recorded 17 first half points for the Falcons including a four-pack from beyond the arc. Prep countered with 9 from senior leader Chinwe Ezeonu. After a thrilling first two quarters, the Greater St. Helens representative Prairie led by a single point 30-29. 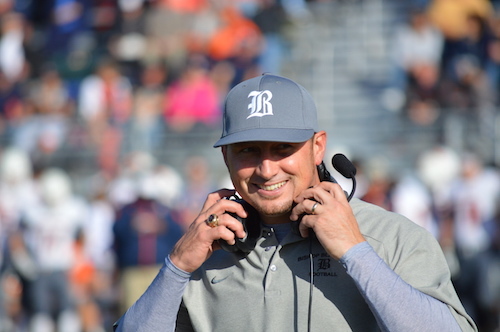 When the teams returned from intermission, the game entered a lull that lasted throughout the third quarter and ultimately dictated the outcome. The Falcons were only able to string together a half dozen points in the frame and the Panthers capitalized by taking a lead entering the fourth and final quarter. In the closing minutes, Ezeonu took the game into her hands by netting tough buckets down low as part of her team-high 21. Prairie’s Jozie Tangeman countered with a strong fourth frame to keep her team within striking distance. With under a minute to play, Bea Franklin connected on an off-hand scoop shot to put the Lady Panthers up four. The Falcons were able to cut the lead down to one possession, but a late steal by Prep was enough to kill the clock and send the Lady Panthers to the state championships next week. 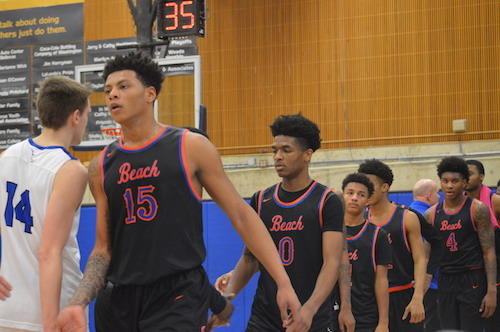 The defending 3A state champions Rainier Beach were back in action on Thursday afternoon following a big win against Garfield two days earlier to battle Seattle Prep for a trip to the district final game on Saturday night. Which Metro rep would move on? The Vikings were successful in establishing their gameplan early while the Panthers stumbled out of the gates. Kevin Porter Jr. put his strong finishing ability on display early en route to a game-high 19 points in the ballgame. 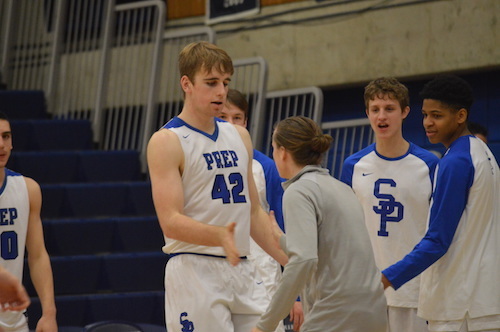 As the first half wore on, Seattle Prep garnered success with utilizing Nic Lynch in the post and cut the deficit to four heading into the break. The pace of play increased as the game progressed and Rainier Beach’s ability to get behind the Panthers in transition ultimately determined the outcome. Fred Roberson put a stamp on the game with a pair of tomahawk dunks despite a solid effort by Prep’s other big man Collin Welp who finished with 15 to lead his team. Bethea’s Beach squad continues their quest to defend the 3A title on Saturday night by earning a district final berth. With a trip to Alaska Airlines Arena on Wednesday on the line and a chance to play the top-ranked team in the country Nathan Hale, the West Seattle Wildcats who entered on an 8-game winning streak hosted the Seattle Prep Panthers on Tuesday night. The guard battle between Aaron Nettles & Nate Pryor took center stage with both floor leaders trading buckets. Nettles buried a step back fadeaway triple at the first quarter buzzer to give Prep an early lead. This carried to halftime with Nic Lynch also making contributions down low. 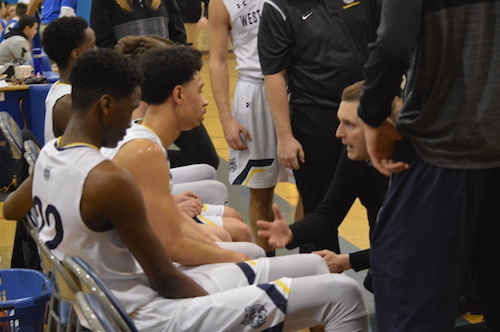 Coach Fazio made the required adjustments at the break as West Seattle began to immediately chip away at the Panther lead in the third quarter. Pryor continued his torrid pace, but needed to rely on teammates down the stretch for clutch buckets. Jack Golgart & Cass Elliott buried some huge buckets from beyond the arc to give West Seattle a three point lead in the final minute. A defensive stop set up a series of free throws which allowed the Wildcats to push the lead out of reach and ultimately punch their ticket to the league championship semifinal. West Seattle 53, Seattle Prep 49. 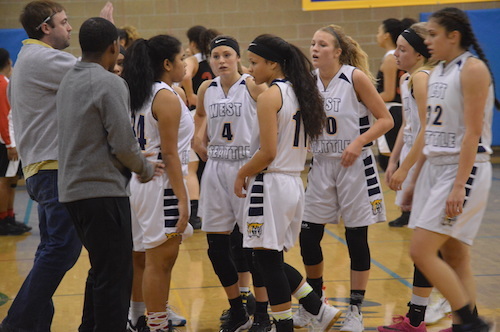 The nightcap at West Seattle featured the home West Seattle team and visiting Cleveland Eagles with the winner heading over to Hec Edmunson Pavilion at The University of Washington tomorrow to take on #2 seeded Rainier Beach. It was a back-and-forth affair in the opening quarter with both teams battling playoff nerves. However, West Seattle put together a decisive second quarter which set up an 18 point lead by halftime. Kelsey Lenzie was lethal from the perimeter and Grace Sarver was scoring anyway she wanted to. Jazzeem Bethea tried to keep the Eagles in the game, but was it too late? West Seattle’s dominance continued in the second half as airtight defense led to one fastbreak after another. In total, four Wildcats scored in double figures. On the other side, Giavanni Flowers put together a strong second half, but the damage was done. The young, talented West Seattle squad is moving on to the big show on Wednesday night at Alaska Airlines Arena at 3:30pm. West Seattle 71, Cleveland 52. On the final night of regular season play, O’Dea hosted their Capitol Hill rival Seattle Prep on senior night to close out another great year of Metro League play leading into the postseason. The back and forth affair started with a hot start by the home team with Noah Williams & Xavier Smith knocking down shots early and giving the Irish an early ten-point advantage. As the first half progressed, Prep’s floor general Aaron Nettles made his presence felt by beginning his three-point barrage and setting up his teammates with open looks to the cup. Trailing by a pair at halftime, could the Panthers get their bigs Collin Welp & Nic Lynch involved to head into the Metro League playoffs with a victory? Prep emerged from the locker room on a mission as the visitors opened with an extended run primarily through deep shots from Nettles. In total, the senior guard knocked down a half-dozen from downtown as part of a game-high 27 points. However, O’Dea countered with Russell Whealdon as a deep threat and buried a four-pack from beyond the arc. In the final minutes of regulation, the lead bounced back and forth several times with O’Dea taking a late lead on a tough Xavier Smith jumper in the paint. The lead grew to three after a Fighting Irish defensive stop and a pair of free throws. Seattle Prep called a timeout with a chance to draw up a play to push the game into overtime. Nettles quickly received the ball on the baseline beyond the arc, his shot bounced of the side of the backboard back into control of Prep’s Kalu Stricklin who quickly returned the ball to Nettles for a final shot. At the buzzer, the ball glanced off the front rim and the Irish players met at mid-court with exuberance after surviving a full full-quarter effort. O’Dea 73, Seattle Prep 70. 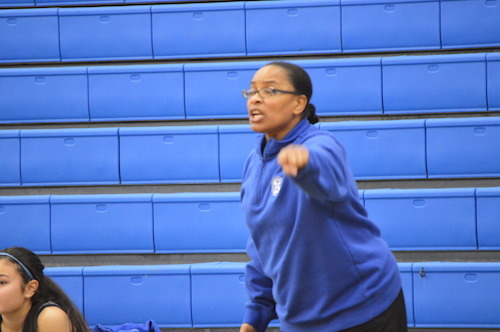 Longtime head coach of the Lady Panthers Michelle Hall joins theFinalScore.TV to talk about her young and talented squad this season that has jumped out to a 4-0 start heading into the holiday break. Seattle Prep will head south to California for tournament play to test themselves before jumping back into league play. She also discusses the high level of competition in the Metro League this season. After spending six years rebuilding Bishop Blanchet, Aaron Maul has taken over as head coach of the Seattle Prep Panthers. He talks about the rise of the Braves which culminated in a run to the final four in 2015. Also, Coach Maul discusses some of the top players on the Panthers and his optimism to build a strong program at Prep. As league play is in its final weeks and the playoffs are on the horizon, here at the top ten rankings for the 3A classification! Not only the best team in the state, but among the best in the country. While Bethea’s Beach Boys patiently await their anticipated game against Garfield, they continually breeze through their league schedule. The Wolverines have all the pieces necessary to match up against any team that stands in their way. If they continue to “Do What We Do”, this team could make a serious run. The Abes have earned the distinction of Tacoma’s best right now. Tough interstate loss against a strong West Linn squad last week, but still top ten material. Defensive minded Lions have held opponents to 50 or fewer points in 10 of 16 games. A convincing win over O’Dea on a big stage at the Unity Hoop Showcase showed these rising Eagles are for real. A polished leader at point guard and a staunch front court is a nice recipe for a well-rounded Wildcats squad. The Hilanders are holding their own nicely against a 4A-laden GSL. Terrell Brown led the top ranked Garfield Bulldogs with 23 points in their victory over Seattle Prep on Tuesday night. 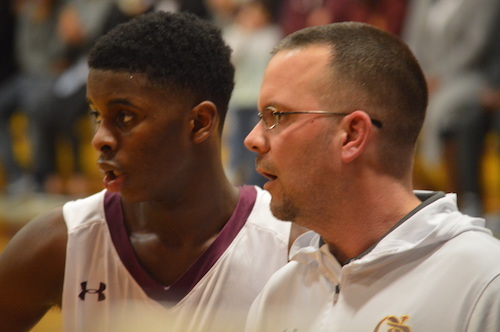 Ed Haskins’ defending state champs were victorious by a comfortable 22 point margin, but Steve Kelly’s young Panthers squad showed they can compete with the state’s best in this one. The first half was very physical and thus many key players from both sides received fouls that tested the depth of both rosters. Garfield had early success when they applied the full court press, especially with Prep’s floor general Aaron Nettles on the sidelines. The front court battle of Garfield’s Alphonso Anderson and J’Raan Brooks against SP’s Collin Welp and Nic Lynch was exciting as both duos were integral scoring combos for both teams early. The forwards combined for 14 and 13 in the first two quarters respectively. At the break, Brown’s five field goals helped the Bulldogs earn a 45-30 lead. Needing to chip away the GHS lead to give themselves a chance in the fourth quarter, Seattle Prep needed to start the second half strong. However, the opposite occurred. Garfield extended the lead to 21 points early in the third as they were able to play at a high tempo and score on the fast break. 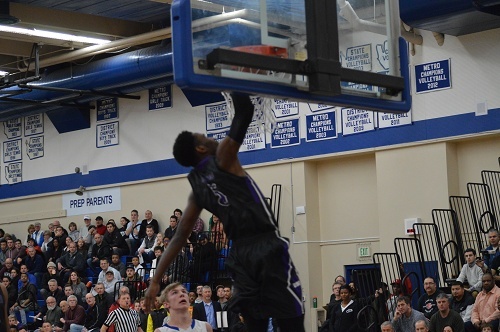 Jaylen Nowell put a stamp on the game when he threw down a pair of dunks as part of his 14. Prep’s lack of consistent shot-takers dashed their ability to keep pace with the high-flying Bulldogs. The Panthers put together a strong final quarter even though Garfield’s big lead was not in jeopardy. The home team earned 20 trips to the free throw line in which 13 were made. Coach Haskins was able to distribute minutes up and down his roster in the fourth quarter to close out the ballgame. Double digit scorers for the Bulldogs included Daejon Davis, Brown, Nowell, and Brooks. Seattle Prep’s Nettles, Welp, and Lynch scored in double figures. Coaches will always tell you it is difficult to beat a team three times. The fate of the Bulldogs lay in those circumstances Friday night, as the final four teams in 3A boys all came from the same league, the Seattle Metro league. This matchup is distinctly size versus speed. The Panthers start three players over 6 foot 7 and the Bulldogs don’t have a single player above 6 foot 6. But speed has prevailed in their previous matchups, with the Bulldogs controlling the pace and the game. The speedy Bulldogs set the pace early, amassing 19 points to the Panthers nine in under five minutes of play. But back to back threes by the Panthers put them right back in the game. Garfield held an eight point lead going into the second. The eight point lead ballooned to 20 quickly, with seemingly every player on Garfield getting in on the action. Coach Haskins uncharacteristically used ten players in the first half. His team is typically 5-6 deep, but he opened up his bench and let them roll over the Panthers in the first half. They led by as many as 24 in the second, but the Panthers cut it to 46-30 at the half. Garfield’s heat in the first half turned to ice in the third. They scored just four points in the first six minutes of the quarter, allowing the Panthers to cut the lead to eight. The bleeding continued to for the Bulldogs, as there seemed to be a seal over their basket. The Panthers trailed by just six entering the fourth. Prep kept their momentum early in the fourth. A Colin Welp three for the Panthers cut the Garfield lead to just three, 56-53 with 5:30 to play. The three point lead was maintained for the next three minutes as neither team was able to convert on the offensive end. Jaylen Nowell broke the cold streak with a pair of free-throws to push Garfield up 60-55 with 1:30 on the clock. Aaron Nettles responded for the Panthers with a mid-range jumper, cutting the lead back down to three with under one minute to play. Nowell answered again for the Bulldogs, converting on a spin move floater off the glass to extend the lead back to five with 32 seconds on the clock. The ensuing possession resulted in another Welp three pointer, electrifying the Panther crowd, now just down 2 with 10 seconds to go. The Panthers, forced to foul, fouled Terrell Brown, who hit both free throws, icing the game with a four point lead. A Jack Stewart three for the Panthers missed just long, and the Bulldogs took the contest 64-60. Seattle Prep knew they were in for a tough matchup when facing the #1 3A ranked team in the state, the 4A defending champion Garfield Bulldogs. Garfield came out swinging early in the first frame of this contest, putting up a cool 20 on the Panthers, who had no match for the speed and quickness of the Bulldogs. But Prep would not go down without a fight, scoring 14 points on the back of Collin Welp’s 7 to trail by just six going into the second. The first five minutes of the second quarter all belonged to Seattle Prep. The Panthers zone defense was stifling to the quicker but smaller Bulldogs. Prep cut the Bulldog lead to just one, 26-25 with three minutes to play in the half. But the Bulldogs responded, as they normally do, with a commanding 8-0 run to end the first half with a nine point lead. Garfield extended their lead again in the third quarter, with sophomores Jashaun Agosto and Jaylen Nowell leading the charge. Prep continued to hang around, but the Bulldogs were in control. The fourth quarter came down to the final three minutes, with the Bulldogs clinging to a six point lead. Prep could really never get over that barrier, as Agosto forced two late turnovers that sealed the contest for the Bulldogs, 64-49. What a great game! In a clash of titans in the metro league, the Seattle Prep Panthers traveled south to take on the Rainier Beach Vikings. Both teams walked into this contest with 16 wins under their belt, clearly putting themselves in the elite conversation for Metro and for state in 3A hoops. Prep started the game on a great run, capitalizing on the size mismatches they bring to every game. It is tough for a high school team to matchup against three starters that all measure 6’8″, and that is what the state has to be prepared for against the Panthers. Prep got off to an early lead, stemmed by a 10-0 run and Jack Stewart’s 2 three pointers. But Beach battled back to trail the first quarter by just two, closing the quarter on a 35 foot bank shot by Washington commit DeJounte Murray. Beach began to put their foot on the gas in the second quarter. Ivy Smith and Shadeed Shabazz forced numerous turnovers in the Panther backcourt, leading to easy layups and dunks. The second and third quarter were a little messy for the Panthers, who only put up 20 points total against Beach’s 38. But Prep would not stop battling. Beach assumed they had the game in hand with such a comfortable lead in the fourth, but the Panthers scratched and clawed to cut the lead to just 4 with under two minutes to play. The Vikings again stepped up with their tenacious defense, forced two critical turnovers, and sealed the win with a 61-54 final. Thursday night marks day three of the Metro League tournament and the battle for the five seed pitted the Prep Panthers and Bainbridge Spartans. Both teams have already punched their ticket to districts but the result of this contest determined the matchups in the SeaKing tourney. The winner would face the 7th seed from Metro in West Seattle and the team with the loss would meet third seed from KingCo in Mount Si. The Panthers have beaten the Spartans in their lone matchup on January 17th, would the visitors from the island return the favor? The game got off to a slow start as the first points of the game were not scored for the first 2:10 of the game. Prep sharpshooter Jack Stewart was unable to connect on his early attempts from the perimeter, something uncharacteristic for the junior guard. However, the Spartans had scoring issues in the first quarter too as the first bucket came at 4:11 left in the frame. Give Prep’s defense credit as BHS scored only seven points in the first quarter. Coach Kelly’s defensive gameplan continued to succeed as the Panthers established good position to disrupt shots and forces offensive charges. Sophomore Eric Van Hare was a spark off the bench as he drew back to back charges before the half. The low scoring nature of this game would take a 22-16 Prep lead into the break. The second half would continue the exciting matchup of bigs in SPHS forward Sean Gummersall and Spartan center Oskar Dieterich. They scored some of their team’s most crucial buckets as the posts registered eight and seven points respectively. Seattle Prep’s dynamic guard Aaron Nettles played with his high intensity style on both ends of the floor as one of his highlights was an and-one after knocking down a circus shot in traffic. The freshman scored a game-high 14 points. Bainbridge guard Blake Swanson knocked down shots late, but the damage was done and the game was too far out for the Spartans to recover. The relentless Seattle Prep defense was the x-factor of this contest as BHS was only able to score 42 in a playoff game. The Panthers were able to pick up a 57-42 win in front of their home crowd. The rivalry between Seattle Prep and O’Dea travels back through many generations. These Metro League schools are on the same street, but seemingly worlds apart. Basketball games between Prep and the Fighting Irish are always exciting and competitive; Tuesday night was no exception. Eight extra minutes of basketball were required to determine a victor between two of Seattle’s premier hoops programs. The host Irish squad seemed tentative from the get-go as senior point guard Tyler Kidd displayed frustration in the lethargic O’Dea offense. Coach Kelly’s Panthers were able to force their opponent to take ill-advised FG attempts in the first half. Prep sharpshooter Jack Stewart found a groove from distance as the junior nailed three from downtown in the first half. The Irish dug themselves into a nine point deficit at the half largely due to a balanced offensive attack. The combo of Quin Barnard and Jacob Lampkin accounted for 17 of the Irish’s 22 points in the first sixteen minutes. The home team would need more contributors down the stretch to avoid a season sweep from their league foe. O’Dea chose to adjust to a smaller lineup in the third as they loaded the floor with guards. The speed of the game increased noticeably and the floor opened up for scoring attempts in transition. 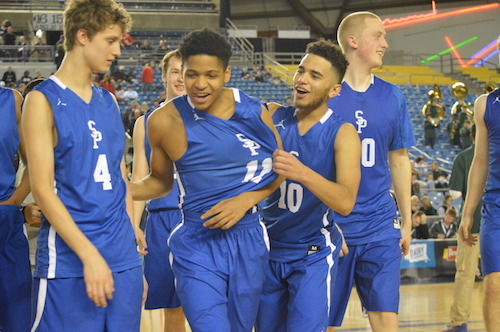 Seattle Prep remained composed as Stewart buried another pair from the perimeter en route to a game-high 20 points. With a ten point lead heading into the final frame, the Panthers were eight minutes away from securing an impressive road victory. Enter Jamie Orme. The 6’6” senior guard/forward combo for the Irish demanded the ball to get his team back into the game. 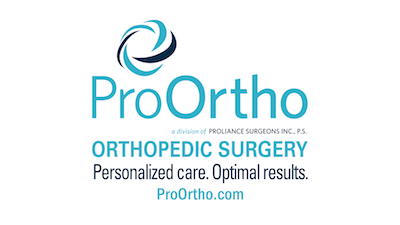 Orme was a perfect six for six from the free throw line down the stretch and disrupted a number of Prep shots in the final quarter. Tied at 56 apiece, each team had a final possession to win the game in the final thirty seconds, but both came up empty handed. We were headed to overtime. A defensive minded overtime period only led to one bucket for each squad in four minutes. We headed into double overtime, and Kidd rose to the occasion. O’Dea’s quarterback on the court buried a contested turnaround jumper and slipped a perfect pass to Orme in the low post for two daggers. Prep’s desperation shots did not fall and the Irish locked up a 64-60 victory in double overtime. One of the many games slated for this Wednesday night was a Metro League clash between the visiting Wildcats of West Seattle against the Seattle Prep Panthers. The Sound division leading Wildcats (4-1 league, 7-3 overall) are without a senior on the roster, but experienced nonetheless and loaded with a powerful frontcourt. Michelle Hall’s Prep squad (3-4, 4-7) are coming off a state runner-up season, but the graduation of integral seniors from the 2012-2013 campaign have left the 15 year coach with a young team. This Wednesday night home game would be a step in the right direction for the blue and white. The first quarter started with a 8-0 run for West Seattle. Lydia Giomi’s rebounding ability created multiple scoring opportunities on single possessions which helped the Cats grab a 12-4 lead after the first quarter. Prep responded to their mismatch nicely by knocking down shots from the perimeter. Their three buckets from downtown in the period brought the Panthers back within four points at the half. At intermission, WSHS led 21-17. Seattle Prep’s senior leader Mary Ann Santucci heated up in the third quarter; unfortunately she was the only one doing the scoring for the Panthers. This low-scoring affair kept the ballgame balanced even though West Seattle was able to retain the lead they garnered from the tipoff. The Wildcats were able to protect the ball in the fourth quarter as Seattle Prep attempted to make a late run. They drew fouls instead of turning the ball over and buried four of five in the process. Prep got a pair of three-balls late by Santucci, but it was not enough to erase the deficit for the home team as West Seattle picked up the 40-35 victory.